École des Ponts Business School entered North Africa in 1999 with its MBA program based in Casablanca, and quickly laid its footprint as the leading MBA in the Maghreb region of Africa. Our business school stands today at the cusp of dramatic changes. What started as an MBA-provider, with programs in Paris (1987), Casablanca (1999), and Shanghai (1999), is now a full-fledged business school offering a growing range of undergraduate, full time MBA, E-MBA, and E-DBA (doctoral) programs, corporate and custom executive education programs, and multiple recent research initiatives stretching geographically across Africa, Asia, Europe, the Middle East and North America. With the recent launch of several high-profile research initiatives, the school has acquired prominent visibility, and the opportunity to take a thought leadership role by telling the stories of trailblazing and/or emblematic companies and actors who are, notably, “in business to make a better world” (the motto coined by the school’s founder, Dame Celia Russo, in 1987) within the African context or applicable thereto. The Center for Advanced Studies of Enterprise (CASE) – Africa & Rest of World (ROW) at École des Ponts Business School is a business and management case development center which focuses on Africa – local African institutions, companies and start-ups doing business in Africa; international institutions, companies and start-ups doing business in Africa, and African institutions, business and start-ups doing business outside of Africa. However, we do not wish for the rest of the world to be feel excluded, thus we will also, on occasion, publish case studies for companies outside of the African context, usually with an African theme – including, but not limited to business models, circular economy, technological leapfrogging, jugaad and frugal innovation, and social entrepreneurship. CASE Africa & ROW aims to establish thought leadership in emerging successful and promising business and management practices in Africa by identifying, documenting and showcasing advanced practice in action of leading startups, companies, institutions and governments acting in the African context, or elsewhere in the rest of the world in ways that could also be applicable in the African context. CASE Africa & ROW will be the foremost case study center dedicated to Africa in the world. The CASE center will be transversal and transdisciplinary across our research centers, research initiatives, and executive education programs. We will leverage our growing research footprint, our important alumni and expert networks across Africa, as well as the wide array of faculty and experts we work with within the business school, within our alma mater – the Ecole des Ponts ParisTech, and more broadly with other academic institutions, as well as industrial partners on all continents. CASE Africa & ROW is committed to enhancing the understanding of business and management practice in the African context across a wide spectrum of interested parties and stakeholders including scholars, researchers, startups, SMEs, multinationals, public agencies, international institutions, local and regional governments, public officials, investors, as well as public and private interests. 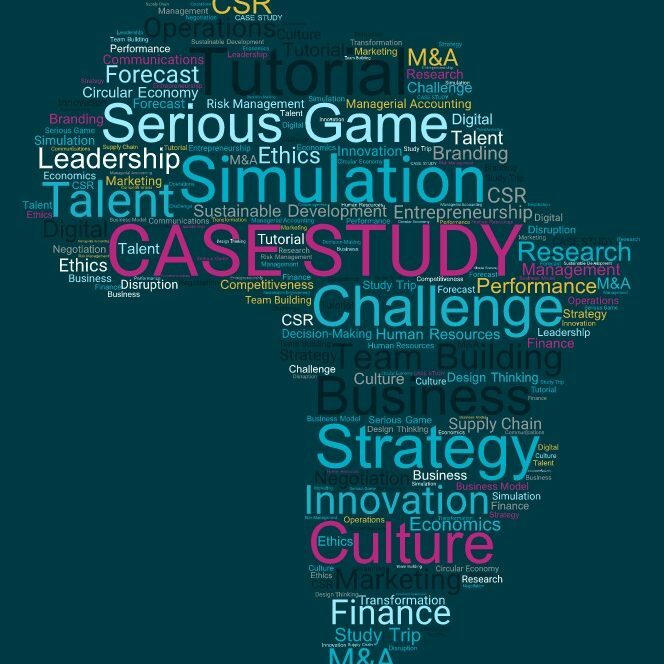 CASE Africa & ROW conducts original case study and survey research, quantitative and qualitative data collection, and data analysis that inform scholarship, practice, decision-making and public policy. CASE Africa & ROW aims to fill the looming and almost embarrassing gap on the supply side — i.e., a marked dearth of African business and management case studies, in general, and an almost complete absence of North African and francophone Africa case studies, more specifically, in the archives of the major case study depositories. While some business and management cases will be teaching cases, we also encourage more advanced research cases, e.g., embedded case studies, requiring collection and analysis of quantitative and qualitative data sets across time and across different embedded sub-units within the target company, institution, or theme with the aim of developing new theories and identifying and interpreting paradigm shifts in business management. As a positive externality of this research effort, CASE will also, on occasion, publish white papers, articles, working papers, and conference notes. Case studies and affiliated works will be published in a École des Ponts Business School business journal (slated to be launched in 2019) as well as in case study libraries (e.g., the Case Centre ex-ECCH). The overall intent is to create a forward-thinking transversal and transdisciplinary case study center which fosters debate, grounds theory in practice and practice in theory, and helps to bring new and best practices to the surface for a wider audience – academic, professional, governmental and institutional. CASE Africa & ROW activities will be overseen by a Director and an Academic & Research Council (ARC). The quality of the research output is assured by a Scientific Committee of Peers and Experts. Those interested in developing a case study or sharing their ongoing work under our sponsorship should contact Dr. Suman Modwel (modwel@pontsbschool.com) with a short description of their idea, framework, case and/or theme.